Investors also turned cautious over passage of the long-pending GST bill in Rajya Sabha in the ongoing Monsoon Session of Parliament. Market posted its worst single-day fall in nearly one month as the benchmark BSE Sensex plunged by 205 points to 27,710.52 after earnings of HDFC Bank and Kotak Mahindra Bank raised concerns over bad loans, while global cues remained largely muted. Meanwhile, profit-booking by retail investors dragged down mid-cap and small-cap indices by 0.19 per cent and 0.14 per cent, respectively. Shares of the second largest private sector lender HDFC Bank fell 0.30 per cent to Rs 1,228.45 despite reporting a 20.15 per cent increase in profit to Rs 3,238.91 crore. Kotak Mahindra Bank plummeted 2.71 per cent to Rs 760.80, even as it posted almost fourfold jump in standalone net profit to Rs 741.97 crore. Net NPAs rose to 1.06 per cent of net advances as of June quarter. Axis Bank was the worst performed on the Sensex, falling by 3.62 per cent to Rs 538.25. “While cement and pharma stocks gained on sector specific announcements, banks fell ahead of key earnings, and looked to have run out of fuel after the capital infusion announcement, lending a weak bias to market,” said Anand James, Chief Market Strategist, Geojit BNP Paribas Financial Services. After opening higher, the BSE Sensex slipped into the negative zone on profit-book and touched a low of 27,687.54. 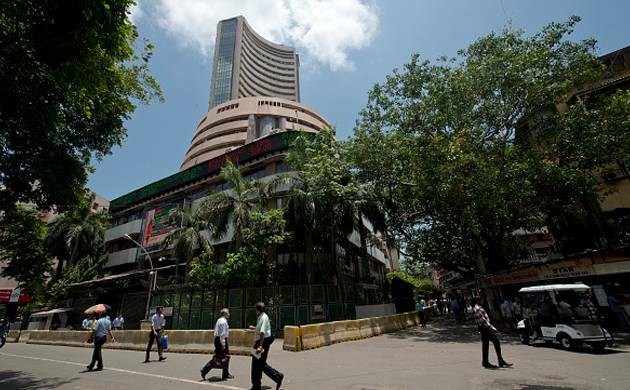 Riding on the initial rise, the total market valuation of the BSE-listed companies surged to an all-time high of Rs 107 lakh crore during the day. However, it later pared some of the gains to settle at Rs 1,06,25,058 crore. The Sensex finally settled 205.37 points or 0.74 per cent lower at 27,710.52. It had fallen by 604.51 points on June 24. The NSE Nifty ended 55.75 points or 0.65 per cent down at 8,510.10. Intra-day, it touched a low of 8,503.45. Shares of L&T Infotech made a sluggish debut on bourses today, falling 1.73 per cent to Rs 697.65 against the issue price of Rs 710. Elsewhere, Asian shares ended mostly higher with Nikkei leading the pack by 0.77 per cent on reports that Japan is planning more stimulus. Hong Kong’s Hang Seng was up 0.54 per cent while China’s Shanghai Composite gained 0.37 per cent. Europe, however, was lower with London’s FTSE down 0.37 per cent and Paris 0.41 per cent lower, while Frankfurt shed 0.20 per cent. Back home, 23 stocks out of the 30-share Sensex pack ended lower. Major losers included, Power Grid (3.13 pc), SBI (2.30 pct), Dr Reddy’s (2.15 pc), ICICI Bank (2.13 pc), M&M (1.76 pc), Tata Steel (1.67 pc), Lupin (1.65 pc), NTPC (1.56 pc), RIL (1.55 pc), Maruti (1.17 pc) and L&T (0.96 pc). However, Coal India rose by 1.21 per cent, followed by Adani Ports 1.13 per cent, Asian Paints 1.06 per cent, Bharti Airtel 0.84 per cent, Wipro 0.72 per cent and HUL 0.36 per cent. Among the sectoral indices, power fell by 2.10 per cent followed by utilities 1.73 per cent, bankex 1.70 per cent, finance 1.02 per cent, capital goods 1.01 per cent, healthcare 0.80 per cent, realty 0.78 per cent, auto 0.70 per cent and metal 0.63 per cent. The market breadth turned negative as 1,595 stocks ended in red, 1,089 stocks closed in green while 185 stocks ruled steady. Total turnover rose to Rs 3,388.14 crore from Rs 3,196.09 crore yesterday.